Consumer Reports has begun putting a Hyundai Kona Electric through its paces as part of its extensive testing program. The final results won’t be known until its testers have had a chance to put some miles on the car, but its initial assessment is highly favorable. “It doesn’t have a gimmick, it doesn’t feel tinny or look goofy, and it has a range long enough that it should allow you to travel to work and back — and then some. It’s just a practical car that happens to be electric.” (Emphasis added.) Isn’t that just what we all want to see when it comes to a vehicle — a practical car that just happens to be electric? CR has already declared the gasoline powered Kona to be one of its favorite sub-compact SUV type vehicles “largely because its nimble handling and stylish design add a dash of pizazz to an affordable, practical package.” The electric version starts at $37,495 and is eligible for the full $7,500 federal tax credit. That car comes nicely equipped with heated front seats, LED daytime running lights, Android Auto and Apple CarPlay, automatic emergency braking, blind spot warning, and lane keeping assist. The car CR chose was the Kona Electric Limited, which lists for $41,150. The Limited adds leather seats, a sunroof, LED headlights, and wireless charging. The Kona Electric uses the same powertrain found in the KIA Niro Electric and the latest KIA Soul Electric — a 201 horsepower motor drawing power from a 64 kWh battery. Its range according to the EPA is 258 miles on a single battery charge. One preliminary finding reported by CR is that the range estimates line up well with real world driving experience, even in cold weather driving with temperatures as low as 25 degrees Fahrenheit. It praises the Kona Electric for its athletic handling, due in part to having its battery mounted low in the chassis. Another like is that the battery does not use up any of the car’s load carrying capacity as compared to gasoline powered models. Acceleration is sprightly. In fact, the car is faster and quieter than its ICE cousins, something that will come as no surprise to EV fans. Hyundai claims a fully depleted battery requires 9 hours 35 minutes to recharge using a 240 volt Level 2 charger. A 50 kW Level 3 charger can charge the battery to 80% from empty in 75 minutes. A 100 kW Level 3 charger can do the job in 54 minutes. So far, the only nits that need to be picked according to CR are a tendency to spin the front wheels when accelerating in slippery conditions and for the car to drift wide on icy corners. It suggests the low rolling resistance tires may contribute to both conditions. All weather or winter tires would likely help the situation, but would also affect maximum range the rest of the year. Give a nod to Tesla for having a more refined motor control system that virtually eliminates any wheel spin or sliding when the road gets slippery. 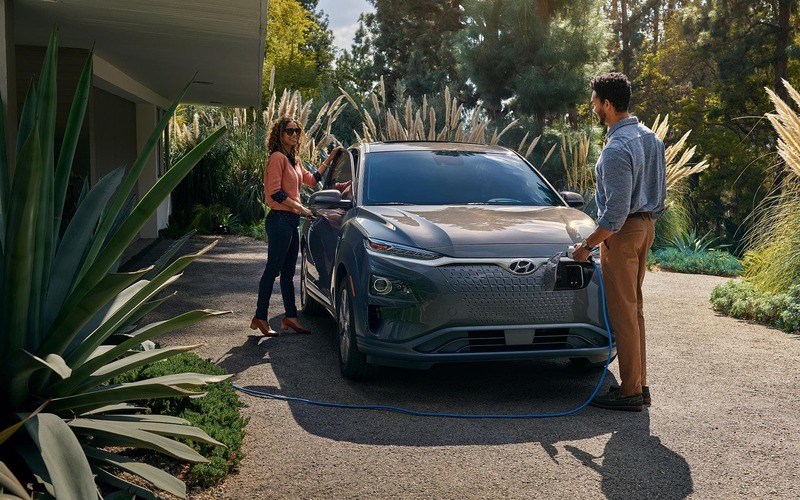 Consumer Reports’ biggest complaint is that the Kona Electric is presently only available in California and the other states that adhere to exhaust emissions strictures put in place by CARB. People in the rest of the country won’t have access to this tasty all electric offering from Hyundai. After its testing is completed, Consumer Reports will issue a final report and rate the Kona Electric against competing electric cars like the Chevy Bolt, Nissan LEAF, and Tesla Model 3. Once those results are available, we will rush to make them available to our readers.